You don’t need to live in Atlanta (or any part of Georgia) very long to realize that the summers are long and hot. Even without major long term droughts, summer rainfall is sparse. Having a landscape that looks good throughout these frequent droughts will enhance your home’s value as well as increase your year-round enjoyment. One way to make a landscape more drought proof is to cut back or eliminate large expanses of turf. Turf areas require more water than any other part of the landscape. Many of us have become used to having a lush, green carpet of grass in the landscape but this luxury comes at the price of high water use. If an open area is desired, mulch, stone, or brick surfaces can be substituted for turf. However, there are turf grasses that are more drought resistant than others. Bermuda, for example, will become dormant during periods of drought, then recover when rainfall resumes. Fescue, on the other hand, is not very drought hardy and may die during extended dry spells. A good rule of thumb for drought resistant landscapes is to plant more shrubs and fewer annuals. Shrubs and trees have deeper roots and, once established, they can withstand longer dry periods. Conversely, annuals by their very nature start out small each spring with shallow roots and if they hit a drought too soon after planting they will never grow well. Another factor in drought resistance is to find plants that thrive in the Atlanta area. Those trees, shrubs, and perennials that are native to the southeast will do much better than a tree that is at the edge of its natural habitat. Planting the material in the right place will also help particularly if a plant is labeled to grow in part shade. If you try to grow such a plant in full sun it may perform poorly and show extreme stress in a drought. Another strategy for conserving water is to group together plants that need supplementary water. 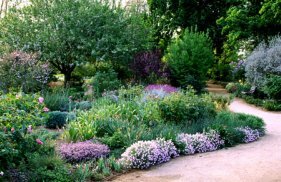 Better to locate plants that do not require additional water in a separate area of the landscape, rather than to mix them with plants that require irrigation. A professional landscape designer can do this in such a way that the separation of drought resistant plants and those that require more water is not obvious and appears seamless to the casual observer. Looking at what is thriving in midsummer will also give you some ideas of what does well in Greater Atlanta. Medians are frequently planted with crape myrtles, and although this is perhaps overused in the landscape, there are some beautiful varieties that have rich cinnamon colored bark that give them year round interest. Indian hawthorn, lenten rose, loropetalum, and many viburnums are some of the drought-resistant plants commonly found in the Atlanta area. There are other plants, such as crocosmia, lantana, aspidistra, lavender, rosemary, nandina, salvia, tea olive and deodar cedar that, once established, hardly require any supplementary water. Even many hydrangeas, such as the beautiful oak leaf hydrangea and panicle hydrangea are drought-resistant once established. Ornamental grasses are also very useful in drought tolerant designs. From small deep purple varieties to large pampas grasses there is a perennial grass for almost any situation. This is another group of plants that give year round interest as the plumes stay on many of the grasses well into winter. Some grasses also give seeds for birds as a bonus in your garden. Camellia and magnolia, of course, are wonderful in almost any southern garden, and are quite drought tolerant once established. These shrubs and trees have deep green leaves that are maintained throughout winter months. Camellias vary in bloom time according to variety, but there is generally one in bloom from November through March. Likewise there are magnolia varieties that also bloom early such as the pretty star magnolia, which blooms in February. These are just a few of the shrubs that will look good throughout any Atlanta summer, but they also survive beautifully in those frequent drought years, when many other ornamental shrubs struggle. However, designing for drought tolerance goes beyond making the right plant choices. The need for water means that irrigation systems will always be necessary. But cistern systems, (large-scale rainwater collection systems), and gray water systems which use recycled household water from showers, sinks, and washing machines, are viable and water-wise alternatives to conventional irrigation systems which are entirely dependent on municipal water supplies. Still, rain water collection and gray water recycling will not provide the volume needed to allow metro Atlanta residents to water as liberally as they have done in the past, and other changes to irrigation systems are necessary to maximize water savings. These include the use of drip lines instead of spray heads for beds of ornamental plants and the substitution of pressure-regulated, low-flow spray heads where drip irrigation is not feasible. Fortunately, we in northern Georgia have been blessed with a soil that is naturally water-conserving. That's right, the heavy clay soil which Atlanta area gardeners have been cursing for years is actually very good at holding water and nutrients. For years, many of us have been trying to break up that clay with soil amendments, such as sand, for better drainage. But it's more water-wise (and less expensive) to leave it as it is. Better to find plants that thrive in our water-retentive native soil, than to spend lots of money, time, and effort trying to improve it only to find that in doing so, we have created an environment that wastes water.